Follow Your Heart makes some fantastic foods for those of us on restricted diets. Their newest creation is a vegan egg that is free of soy, dairy, egg, gluten, and nuts. It comes in this cute little box that looks like an egg carton, but the contents are yellow powder in a bag. I like the package though because it feels fun and whimsical. You can use this substitute for making things like omelettes, scrambled eggs, or baked goods and frittatas. It is totally amazing! I have made about ten different omelettes since buying this new product a few weeks ago, I am not kidding! I made scrambled eggs, and I am planning to make some baked goods soon to see how they turn out. My guess is — fabulous, just based on my experiences so far. I used to LOVE eating eggs. I mean, I had them for breakfast almost every day. My favorite was sunny side up with a soft and runny yolk. Boy do I miss those days. Egg and cheese sandwich was second to sunny side and my 3rd favorite was omelettes. With these new vegan eggs, I can’t do sunny side up for obvious reasons (no yolk folks), but I can make tons of omelettes. I don’t really eat bread, so I have not tried making a sandwich yet. Anyway, I have been filling my omelettes with all kinds of fun things. 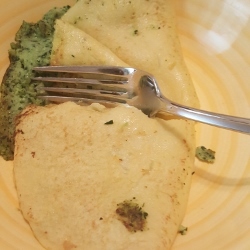 I took leftover roasted broccoli and cauliflower and blended it with a little cashew cheese, then stuffed it into the omelette when cooking it. I did diced sweet potatoes with spinach and vegan cheese. I also really liked putting some leftover shredded pulled pork inside the omelette with sauteed kale and onions. I am suddenly craving an omelette again. I can’t imagine why. I do recommend adding some seasoning to the egg because it is on the bland side. It reminded me of real eggs in appearance and even smell ( I have NO idea how they did that), but the taste was more like matzah meal. When I added fillings, it was just right. But, when I did them scrambled, I felt it needed some garlic, onion, or dill; basil and oregano, or even some pepper. I wrote up this recipe for the broccoli, spinach, cauliflower omelette that I made most recently. You can see the fabulous filling coming out the sides as I dig into my meal. I should have taken photos all along the way so you could see all my creations, but I was distracted by my incredible urgency to eat my ‘eggs’ for breakfast. Let me know if you try this product too. 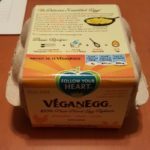 Make your vegan egg as instructed on the box. Be sure to use ice cold water - I keep some in my fridge so it is ready to go when I want to cook these vegan eggs. Mix well to get out the lumps too! Spray a frying pan with cooking spray and put on a medium flame. Add in your egg mixture and let it spread out in the pan. Sprinkle with your seasonings and spices. While your egg is cooking, put your vegetables into the food processor and pulse a few times to break up big pieces. Now run it on blend until everything is a thick puree. As soon as your eggs are starting to hold shape and look less watery, scoop out approximately 4 Tablespoons of the veggie puree and place it onto one half of your omelette in the frying pan. If adding cheese, sprinkle or place it on top of the filling. Carefully press down so it covers the omelette on one side evenly. Now use a spatula to flip the other side of your omelette on top of the filling. Press down gently to help it hold shape. Let it cook for a total of 8 minutes or until the egg that is facing down in the pan is starting to get a little color to it. You'll be able to tell when your omelette is done because the eggs won't be runny anymore too. I used leftover roasted vegetables so I only needed to blend them up. I also used leftover spinach that was in the fridge. Why can we not get this very healthy incredible plant based follow your heart vegan eggs? The new version is soy and that is so harmful to the body and is incredibly harmful for those who are allergic. We just want real food. And the old receipe of Algai from chlorella is simple and healthy!!!! I completely agree, TamaraLynn! I can no longer find the original version and it totally stinks that it is soy based!